This is now the third time that Jesus showed Himself to His disciples after that He was risen from the dead. – John 21:14. 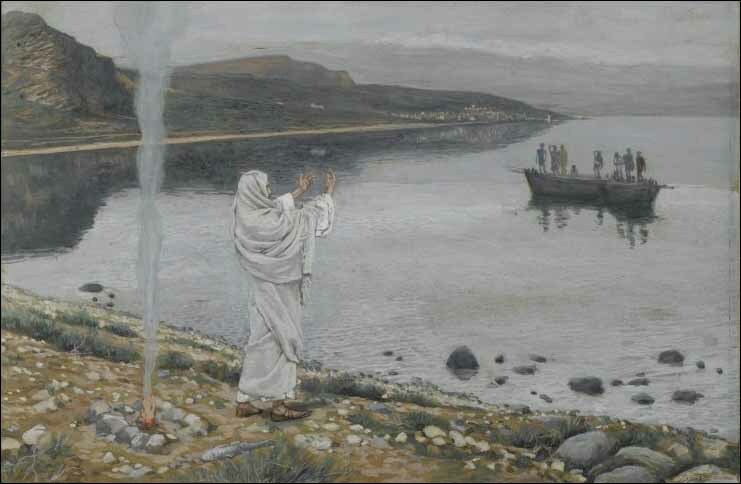 Jesus showed Himself again to the disciples at the Sea of Tiberias, hence, in Galilee. There were together Simon Peter, and Thomas, and Nathanael, and the brothers James and John, and two other of His disciples. Simon Peter said to them: “I go a-fishing.” They said to him: “We also go with thee.” They went forth, and entered into a boat immediately, and that night they caught nothing. But when the morning was come, Jesus stood on the shore, although the disciples knew not that it was Jesus. Then Jesus said to them: “Children, have ye any meat?” They answered Him: “No.” And He said to them: “Cast the net on the right side of the boat, and ye shall find.” They cast therefore, and now they were not able to draw it for the multitude of fishes. Therefore John, the disciple whom Jesus loved, said to Peter: “It is the Lord!” Now when Simon Peter heard that it was the Lord, he girt his fisher’s coat about him, (for he was naked,) and cast himself into the sea. But the other disciples came in the little boat (for they were not far from the land, but about 200 cubits off), dragging the net with fishes. As soon as they were come to land, they saw a fire of coals there, and fish laid thereon and bread. Jesus said to them: “Bring of the fish which ye have now caught.” Simon Peter went up, and drew the net to land, full of great fishes, 153; and though there were so many, yet the net was not broken. Jesus said to them: “Come and dine.” And none of the disciples dared ask Him: “Who art thou, knowing that it was the Lord.” Jesus then came, and took bread, and gave it to them, and fish likewise. This is the third time that Jesus showed Himself to His apostles after He had risen from the dead (John 21:1-14). And these are the men whom God used to testify of the resurrection of Jesus in their writings, that we “might believe that Jesus is the Christ, the Son of God, and that believing [we] might have life through His name” (John 20:31). PRAYER – I thank Thee, Lord Jesus, that Thou so plainly, so unmistakably, and so often did manifest Thyself to Thy apostles as the risen Conqueror of sin, death, and the devil, so that their testimony of Thy resurrection in the Scriptures is true beyond all doubt. Grant me, I implore Thee, that through the testimony of the Holy Spirit working through Thy Word, He may make me ever certain of Thy salutary resurrection that in life and death I may firmly cling by faith to this changeless doctrine for my on-going comfort and strength. Amen. He hath fulfilled the Law of God for me; God’s wrath He hath appeased. Since He in death could perish never, I also shall not die forever. I am content! I am content! His cheering rays beam blessings forth for all, sweet comfort, hope, and peace. This Easter Sun doth bring salvation and everlasting exultation. I am content! I am content!